Traditionally, the biomass, specially fuel wood has been used as an important source of energy since pre-historic days. 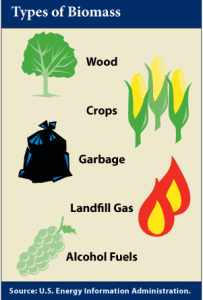 Biomass is an organic substance, living or dead that has potential biochemical energy stored in its bonds and interior. This is a form of renewable solar energy stored in all plant materials everyday in the process of of photosynthesis. The world’s forests and vegetation produce 220 billion tonnes (dry weight) of plant biomass every year by photosynthesis with an energy content much high. This represents some 10 times the world’s current energy usage. Types of biomass used as energy sources are wood and wood wastes; specifically grown energy crops; agricultural wastes such as cotton ginning trash, bagasse, nut shells, oil seeds, rice and wheat straw and husk, corn, stover, prunings and weeds; animal dung, human excreta and sewage sludge; food processing wastes; waste paper and cardboard and major fractions of municipal solid wastes. Biomass energy is, in fact, a living and renewable alternative to the non-living and non-renewable fossil fuels and also much cheaper and cleaner. One is the product of current plant photosynthesis, while other is from those plants, which photosynthesized in the remote past. One tonne of wet biomass has the energy equivalent to one barrel of oil. 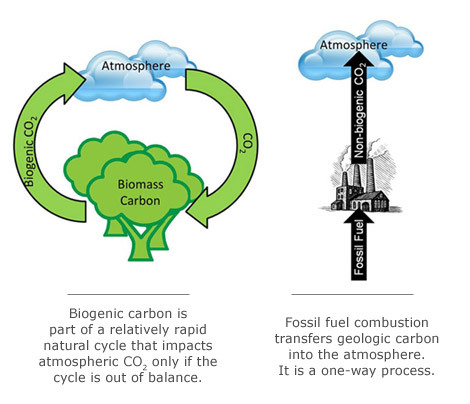 Like fossil fuels, biomass energy can be stored and made available when required. It provides about 14-15 per cent of the world’s energy and is the main source of energy for half of the world’s population in the developing countries, mostly as fuel wood. More than two billion people, or the majority in the developing world, still rely on fuel wood. Modern biomass technology holds tremendous potential for providing cheap, clean and green energy to the civilization. 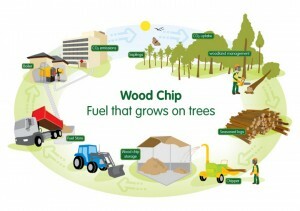 The traditional fuel wood is staging a coming back as a convenient source of energy in our modern society. All industrialised nations of the world, specially in the colder regions of Europe and America still use fuel wood for heating their homes traditionally. For the poor people in the developing countries, fuel wood is the most economical and easily available means of energy for cooking and heating. Several fuel wood species have come to light that have very high calorific value (heat of combustion) and high growth potential. They have very high energy content ranging from several kilo calories per gram. Trema orientalis is a particularly very promising fast growing fuel wood species. It produces 54 tonnes of dry biomass per hectare after only three years of plantation. So why destroy the reserves that take millions and billions years of patience. Why use fossil fuels at all? For blocking your lungs? THINK! Waste is an inevitable by product of human society and is being generated in huge amounts every day, posing problems for its safe disposal. 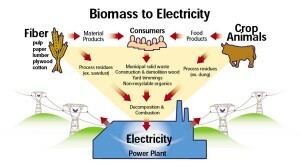 Recovery of energy from waste biomass assumes great significance today. It has multiple environmental and economic benefits for society. It minimised waste disposal and cuts the huge cost associated with landfill construction and operation, and also reduces green house gas emissions (methane) which is rountinely emitted from all landfills. A mean calorific value of municipal solid waste is quite high ranging in MSW. 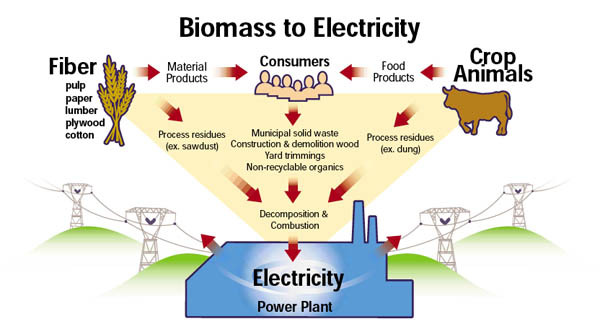 Waste biomass possesses at least half of the energy possesses by coal and can be used to generate green electricity with much lower green house gas emissions and other pollutants. Direct combustion of wood and residues obtained from agriculture and timber industries to produce heat, renewable green electricity or process steam, is the most common method to retrieve energy from waste biomass. Rice hulls are mounting agricultural waste in several parts of the world and technology has been developed to generate electricity by combusting it benefiting both the farmers and the environment. An emerging idea is to ‘co-fire’ large coal based power plants with biomass to incur both environmental and economic benefits. Biomass can replace substantial dirty coal (at least 10 per cent), reduce an equivalent amount of green house gas, generate an equivalent amount of renewable green electricity, and all that without having to incur the capital cost of establishing a separate biomass based combustion plant. In India, the potential for renewable waste biomass energy consisting of agricultyral, industrial and animal waste is estimated to be about hundreds of millions of tonnes per year. Biomass based power plants including baggase from sugar mills, have an installed capacity of hundreds of mega watt. It is now essential for all sugar mills to go for ‘Cogeneration Technology’ using biomass for self reliance in energy and selling the surplus power to the local grid. India’s large population is a blessing to a curse on the grounds of generation of waste used for biomass generation. India being the chief producer of agricultural products and having agricultural backgrounds since ages also supports the biomass generation through huge agricltural waste generation. The “waste-to-energy” movement started with the oil crisis in the Middle East and the increased cost of oil in the 1970s. Following the Gulf War of the 1980s, it further renewed the interest of western nations towards generating electricity from waste. Although incineration has been discredited worldwide, most European nations have waste incinerator plants combined with energy recovery plants, and several categories of wastes, including hazardous wastes , are used as fuel to achieve the dual objectives of waste disposal and electricity generation. Denmark and Sweden are the leaders of this whole system. They incinerate a major portion of their MSW and also produce thermal electricity from steam generation. Of the 12 MSW incinerator plants in the Netherlands, five generate thermal electricity. Some large German cities operate combined incinerator plants providing up to 5-10 percent of the total electricity demand. The U.S.A has few incinerators and incinerates a few per cent of its MSW currently, but recovers energy from almost all the plants. The U.S National Energy Strategy, projected a seven fold increase in the electricity generation from MSW incineration plants by 2010 according to statistics and data. A new idea is to use the wastes as a source of fuel in the kilns of cement industries to replace costly fossil fuels. The accompanying emission problems are also minimised to a great extent.